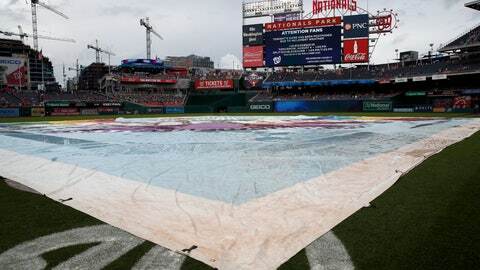 WASHINGTON (AP) — The game between the Cincinnati Reds and the Washington Nationals on Friday night was postponed because of weather. The game will be made up as part of a split doubleheader Saturday. The first game will be played at 1:05 p.m., with the regularly scheduled game to follow at 7:05 p.m. It was Washington’s fourth home postponement and the 46th in the major leagues this season. That’s seven more than last year’s season total. The Nationals and Reds were also rained out in Cincinnati on opening day. Washington beat Cincinnati 10-4 in the series opener on Thursday night. Reds: Minor league RHP Hunter Greene, the second overall pick in the 2017 draft, has been shut down for the remainder of the season with a sprained throwing elbow but will avoid surgery for now, GM Nick Krall said. Greene had been pitching for Class A Dayton. He will enter a non-throwing rehab program. … Cincinnati returned OF Scott Schebler (right shoulder) from his seven-game rehab assignment. Nationals: Manager Dave Martinez said the club continues to keep an eye on RHP Koda Glover, whose 30-day rehab period will end on Aug. 5. Glover has a 3.72 ERA in nine relief outings for Triple-A Syracuse. Reds: RHP Anthony DeSclafani (4-3, 5.47 ERA) was pushed back from Friday to make the early start Saturday. Righty Matt Harvey (5-6, 5.13) takes the nightcap for the Reds in his first game in Washington since departing the NL East rival Mets. He’s allowed two earned runs or fewer in six of his last seven starts, pitching to a 3.84 ERA in that stretch. Nationals: LHP Gio Gonzalez (6-7, 3.78) faces DeSclafani after also being pushed back from Friday. In the late game, RHP Jeremy Hellickson (4-2, 3.59) attempts to continue his strong history against Cincinnati. He owns a 1.50 career ERA against the Reds (24 IP, 4 ER).